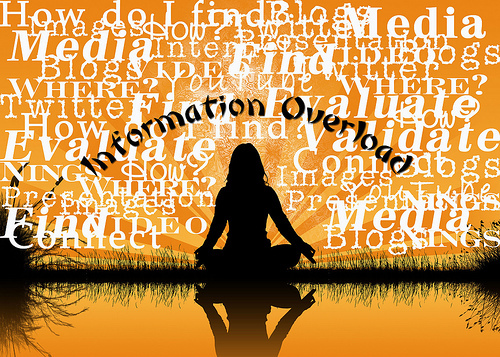 Information overload happens to all of us at some point. Dealing with floods of emails, webinars, videos, articles, blog post, etc. are just a few things that fill up our mental database on a daily basis. Handling information overload is an art form. You need information in order to make decisions but you also need a filter. A way to sort through what is important or not. When it comes to your home or small business, handling information overload is all about being intentional about what goes in your mind so it can be retained as useful information. What’s most important to you as a business owner is to understand your focus areas. You need to see where you should be focusing your work efforts in order to produce results for your business. The top 3 automatic income reducers is your computer, your T.V. and your cell phone. Because of this information overload can naturally creep up. If you spend hours upon hours surfing the web from one site to the other, that has nothing to do with your business then you are actually reducing your income with that activity. Create a Daily Methods of Operations (DMO) blue print for your business so you can keep track of what your important money making activities are. Do you have over 1000, 5000, or even 10,000 unread or undeleted emails just hanging out in your inbox? If so then your information overload lives in your email inbox. On average most people check their email 3-5 times a day. As a business owner those numbers can double. Email is the primary mode of communication for some of your Clients and customers and you must attend to their needs as they come. But more often than not when the matters are resolved and handled, the email is just kept in your inbox. You don’t delete it just in case you have to reference it in the future, which makes sense. But the truth is that most people develop email clutter when they don’t delete these types of emails. In your DMO you should outline when you check email throughout your day. During that time period delete and filter your inbox. If you want to save an email place it inside a particle folder for you to review at a later date. With this practice you will see clearly what needs you attention and what can wait. Weather you love or hate Google this online super power offers some amazing application to simply your DMO task. One of which is managing your online content with Goggle Reader. If you are on multiple list and follow several bloggers and content writer then Google Reader puts all that information in one central location for you. By simply subscribing to your top 5 favorite bloggers RSS Feeds you now have a place to review all their content but also comment on it and syndicate it in minutes. You no longer have to have several windows open and have to jump back and further between content. Everything is organized by blog or website and you can change the setting on how you view the information. Google Reader makes it hard for information overload to overwhelm you in this simple format. One of the best ways to reduce information overload is to take lots of breaks. When you rest your mind a moment from a period of pure focus and concentration, you actually re-energize your mind for the next bright idea. A part of your DMO you should have scheduled breaks. It might be every hour or every 2 hours for a 15 minute break. You can take a short walk, eat a healthy snack, or chat with a friend. But what’s important is that you remove yourself from your workspace and take a break. Remember that your DMO is to help you stay on task. This is not the time for a nap or to watch T.V. These activities will yield you less production when you return back to work which will add to your sense of information overload. Listen how Social Media Expert, Layla Staats, shares how you can reduce information overload and simplify your home or small business to get results that pays.